Few artists can revolutionize an ancient medium, but Peter Voulkos did just that when he brought ceramics into the realm of fine art starting in the late 1950s. Born in Bozeman, Montana in 1924, he studied painting and ceramics at Montana State University and later received his MFA from California College of the Arts in Oakland. While Voulkos began his career by creating utilitarian objects such as bowls and vases that won him wide renown, he began to contemplate abstraction and other fine art principles when he spent the summer of 1953 teaching at Black Mountain College, there he met Robert Rauschenberg, John Cage, and Josef Albers. From there, he visited New York, meeting many of the Abstract Expressionists. Voulkos returned to California to teach at Los Angeles County Art Institute (now Otis College of Art and Design) from 1954 to 1959 and it was in this period that his works really began to evolve. As the decade came to a close, Voulkos moved away from creating functional items, instead morphing vase-like structures into sculpture. He slashed the clay in certain instances and aggressively applied paint to the forms like canvas. No longer content to create works that hid their process of creation, Voulkos made the very act of creation paramount to the understanding and appreciation of his work, much like the Abstract Expressionists that he had associated with. Voulkos’ artistic output piqued the interest of Peter Selz, the Curator of the Department of Painting and Sculpture at the Museum of Modern Art, New York. In 1960, he invited Voulkos to exhibit six of his paintings alongside a number of his sculptures as part of the New Talent series, one man exhibitions that the museum had been offering since 1950 to artists who had not yet had solo exhibitions in New York. Voulkos used this opportunity to illustrate the connection between painting, the classic example of fine-art, and ceramics. After his show at MoMA, the artist spent the summers of 1960-1962, and 1964 in New York teaching and creating work at the famed Greenwich House Pottery and Columbia University. 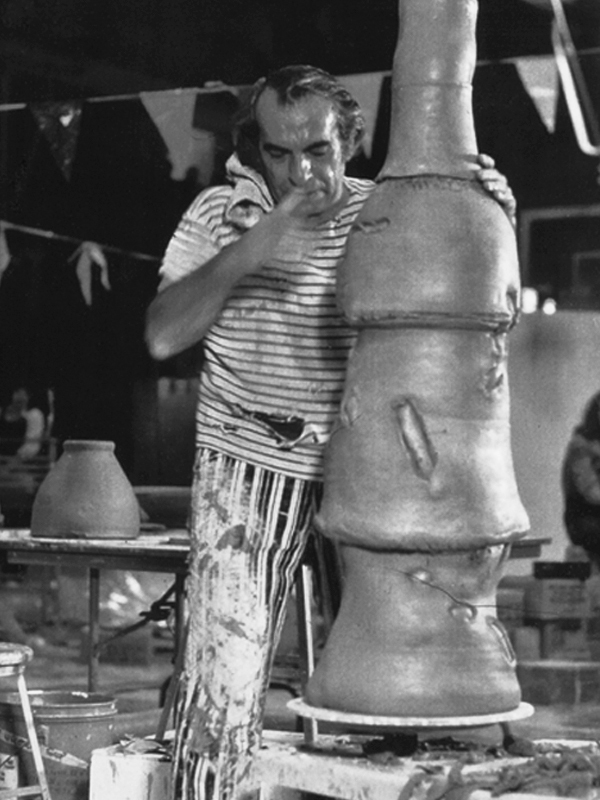 Peter Voulkos brought ceramics into the realm of fine art. He died in 2002, but his legacy is remembered in the collections of the Los Angeles County Museum of Art, the Metropolitan Museum of Art in New York, the Stedelijk Museum in Amsterdam, and the Museum of Fine Arts in Boston.